I ran out of time today, so for anybody who wrote me, I'm sorry! I love you and will get to you when I can! We had a fantastic week, seeing lots of miracles. First of all, we were super excited when Mxxx came to church! There have been several weeks when they haven't been able to come, because they had family gatherings on Sunday, and they had another gathering yesterday, and I began to lose hope, knowing that they normally didn't come. But I said to myself, "Don't lose faith, with God all things are possible!" So I changed my attitude, and put my faith in God, and tried to listen to the Spirit. As church started, Mxxx and Dxxx told us that there were still a ton of people and that they weren't sure if they would make it. (by the way, we have sacrament last) We sent him text messages, encouraging him that they could do it, and that God would be happy. Between priesthood and Sunday school, we sent more messages, encouraging them to come. After Sunday school, I went into the chapel. We hadn't heard from Mxxx, so I decided to go start playing prelude music. It seemed like they wouldn't come. Then right before the meeting started, someone taps me on my shoulder, and lo and behold, Mxxx had come!! He told me that he had just really felt that he needed to come, and that Dxxx had to stay in the house with the family that was there, but that he was there to represent them. I was so happy, I couldn't believe it! Just a tip to any of you out there who might become investigators at some point, if you want to make the missionaries happy, go to church. :D It was awesome. On another note, I have been driving a ton! It seems I officially drive a stick now, as I drove the truck to Hernandarias once, and another time to Paraná, and several times in downtown (which is way harder than the freeway jaja). Vamos oficinas! I know this church is true! This gospel is so wonderful, it fills me with awe and joy. We are so blessed, and our Heavenly Father has a love so real for each of us. I know it. Elder Henriquez, the new historiador! Elder Tello left today for a new area. Also, Elder Carrion gets here today, he will be Elder Llanos' replacement and my new companion. Pretty soon, I will be the oldest office elder (in terms of time in the office). That is super weird! Me and Elder Giacoboni. 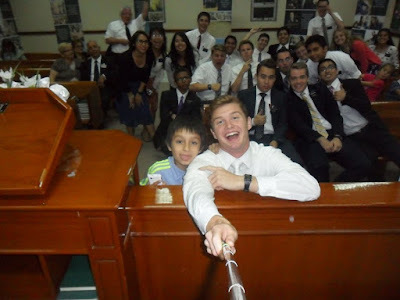 He was ZL in Parana and finished his mission today. He was our zone leader here in Santa Fe for a transfer. An awesome missionary from Uruguay, he was a zone leader for 19 months! That's crazy!